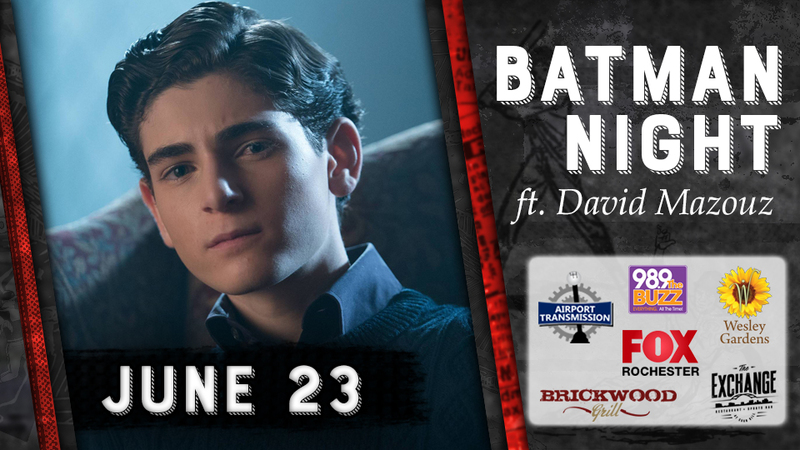 ROCHESTER, N.Y. -- The Red Wings 5th annual BATMAN NIGHT presented by Wesley Gardens Nursing Home and Rehabilitation Center, The Brickwood Grill and The Exchange, Airport Transmission, 98.9 The Buzz and FOX Rochester is set for Saturday, June 23 at Frontier Field! - An autograph appearance by David Mazouz, who plays Bruce Wayne in the hit TV show Gotham on Fox. Mazouz will sign and pose for photos from 6-6:45 pm and again from 7:15-8:00 pm in front of the Red Wings Hall of Fame located on the first base concourse. - An on-field interview with Mazouz about his career and the Gotham series which will include a host of Batman characters and villains. - An appearance by the Batmobile! - The Wings will wear Batman-inspired jerseys which will be auctioned off to benefit the Red Wings Community Foundation. IMPORTANT BIDDING INFO: All of our jersey auctions in 2018 will be done through our partners at LiveSource. Fans will be able to bid on jerseys directly from their mobile phones through the LiveSource app. CLICK HERE FOR DIRECTIONS ON BIDDING. - The post-game fireworks show will feature music from and inspired by the Tim Burton/Joel Schumacher Batman film series and the Christopher Nolan Dark Knight film series. Mazouz won the role of young Bruce Wayne in "Gotham" at the age of 14, and has grown up into the future Dark Knight as the series has progressed into it's 4th season! Mazouz started his career in commercials at age 8. In 2012, he landed the role of mute Jacob "Jake" Bohm in the TV series "Touch." Mazouz has appeared in several television series including "Mike & Molly," "The Office," and "Criminal Minds. " In 2016, he had leading roles in the horror films "The Darkness," and "Incarnate." AUTOGRAPH SESSION DETAILS: Fans will have three options if they would like to receive an autograph and or photo from Mazouz. * Purchase an Autograph Ticket for $20 to get one item signed. * Purchase a Photograph Ticket for $20 to get your photo with Mazouz. * Purchase a Combo Ticket for $30 to get both an autograph and photo with Mazouz. Cash or credit cards will be accepted. You will purchase these tickets inside the gates at the Red Wings Hall of Fame. The gates will open at 5:30 p.m. and the autograph session will begin at 6:00 p.m., regardless of the weather.